Road Lane Block or Traffic Lane Divider serves as a barrier (as a guardrail, fence, or open wall) placed between the lanes of a highway to divide the traffic moving in opposite directions. It is ideal for merges, gores, eliminating prohibited left turns, circles, work zones, and bicycle lane protection. Road Lane Block or Traffic Lane Divider with reboundable post allows vehicles on emergency situation to cross over it. High quality reflective reflector on it is an additional safety feature improving night vision to drivers as where there is lane divider ahead. It is not surprisingly that this type of Road Lane Block or Traffic Lane Divider gain popularity and replaces the conventional concrete Road Lane Block or Traffic Lane Divider. It is easily fixed and dismantled conveniently as and when one wished. High impact resistance Thermoplastic Polyurethane (TPU) post and rubber base designed for long lasting and cost efficient. ~ Work Temperature : Below 25 up to 65 degree. 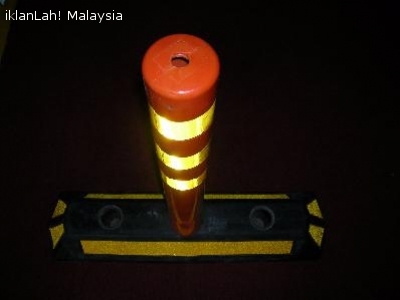 TPU Post Road Lane Block / Traffic Lane Divider market and sale by Flexijoint Industrial Marketing & Services, Kuala Lumpur, Malaysia. Road Lane Block or Traffic Lane Divider serves as a barrier (as a guardrail, fence, or open wall) placed between the lanes of a highway to divide the traffic moving in opposite directions. It is ideal for merges, gores, eliminating prohibited left turns, circles, work zones, and bicycle lane protection. TPU Post Road Lane Block / Traffic Lane Divider market and sale by Flexijoint Industrial Marketing & Services, Kuala Lumpur, Malaysia.Road Lane Block or Traffic Lane Divider serves as a barrier (as a guardrail, fence, or open wall) placed between the lanes of a highway to divide the traffic moving in opposite directions. It is ideal for merges, gores, eliminating prohibited left turns, circles, work zones, and bicycle lane protection. TPU Post Road Lane Block / Traffic Lane Divider market and sale by Flexijoint Industrial Marketing & Services, Kuala Lumpur, Malaysia.For further enquiry, please contact us at T: +6 03 79541136 M: +6 016 3111313 F: +6 03 79808259 E: flexijoint.ims@gmail.com.